Bournemouth Borough Council: Pure Town Planning are pleased to announce a successful appeal win for part retrospective householder alterations and extensions for a property in Alum Chine, Bournemouth. As works had already commenced on site, the applicant sought the assistance of Pure Town Planning to rectify the situation through a part retrospective planning application for roof alterations and rear extensions. As a company of chartered town planners, Pure Town Planning do not condone building works without express planning permission. We would always advise that prior to any development, that professional advice is sought beforehand. Following thorough consultation with Bournemouth Borough Council during the course of the application, this retrospective scheme secured the support of the Planning Officer. However, due to neighbours’ concerns, the application was brought before Planning Board and subsequently refused on grounds of impact on the character and appearance of the area, as well as impact upon neighbouring privacy. Pure Town Planning then challenged the decision of the Planning Board at appeal. 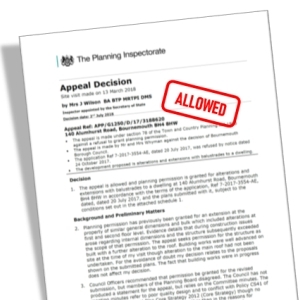 The Inspector purely focused on the planning merits of the proposal and concluded that the roof alterations and increased glazing would not be out of keeping when viewed in the context of the surrounding Alum Chine locality – which itself has seen extensive alterations and remodels over recent years. Having visited the site and fully assessed the potential impact of the upper floor windows upon neighbouring privacy, the Inspector determined that there would be no materially greater impact on amenity by way of overlooking – therefore allowing the appeal. Whilst Pure Town Planning would always advise clients to seek professional advice before the commencement of works, if you do need assistance with retrospective planning permission, please do not hesitate to contact us on 01202 585524 or email us at info@puretownplanning.co.uk for a full assessment in complete confidence.